Veggiechef.com promotes the healthy vegetarian lifestyle. Oser has authored, "Soy of Cooking," a book in which she explains how beneficial soy is to the diet. The best part of the site is the recipe page, which includes recipes using soy, tofu, and vegetarian products. Pictures are included to entice the web surfer. It works. The Fudgy Walnut Chocolate Ring looks absolutely delicious. ...The broccoli Lasagna Rolls are definitely something I will try in the future. 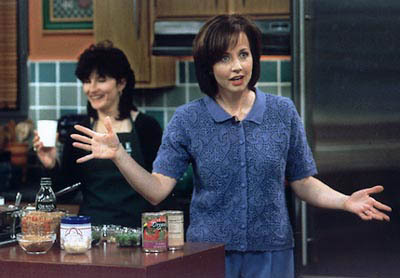 The press releases show how popular Oser, her cooking and her cookbooks have become. This site offers something for everyone. Vegetarians can find ideas for decent meals, and those who love desserts but not thecalories can learn about low fat cakes. .....I've decided to incorporate more vegetarian stuff into my meals. "Not only is soy a mainstay for many vegetarians diets, medical science is proving it to be a panacea for an entire list of ills. From menopause to heart disease to cancer ; the mighty, tiny soybean is proving to be the super hero of the vegetable world. "There doesn't seem to be a downside to soy,"said Marie Oser, vegetarian and author of 'Soy of Cooking.' Not only is herbook full of soy recipes from appetizer to dessert and every course in between, it also outlines the wide range of benefits from adding soy to the diet. It's not just about tofu, said the southern California-based author. It's really excellent stuff." "In Soy of Cooking, [Marie Oser's] recipes are a far cry from "70"s tofu cuisine with offerings like Mushroom Pate, Frozen Fudge Cheesecake, ...and Pumpkin Ravioli." "Everything from appetizers to desserts is covered in Marie Oser's Soy of Cooking. Sixteen of Oser's soy creations are captured in a sharp, mouth-watering section of full color close-up photos. The recipes without photos proved to be just as tasty. Most of the recipes are of the "Gourmet" variety and are elegant enough to serve to dinner guests." "Using tofu, says Marie Oser, author of Soy of Cooking, is an opportunity to displace high fat and high cholesterol products from the diet. She likes to introduce people to silken tofu for it's creamy consistency, using it instead of sour cream or cream cheese in dips and dressings. She has also successfully substituted silken tofu for eggs in baked goods and cream sauces. In devising a Lemon Blueberry Bundt cake [Lemon Blueberry Delite..with Blueberry Topping], Oser used silken tofu and soymilk, along with applesauce in place of fat, to produce a very moist, sweet cake." "Meet Soy, the wonder food...Foods made from soybeans can help you feel better and live longer, says cookbook author Marie Oser. [Soy of Cooking's] recipes use more than 30 different soy products, from smoked tofu to soy mayonnaise, ravioli, and even pepperoni....You can even sneak soyfoods in, if you"re worried about the reaction of your dinner crowd. Oser's "Sausage" Roll Ups are made with GimmeLean, a soy product with the appearance and texture of meat. And Marie's Incredible Brownies combine cocoa, soymilk, and silken tofu for richness without guilt. The recipes, like all those in Soy of Cooking, don't contain , any animal products. In their place, Oser uses soyfoods that mimic the hearty flavor of meat, the creaminess of dairy, and the thickening power of eggs. But without their fat and cholesterol." "It's not just for vegetarians. Soy products..are ideal for recipes, says the author of a new cookbook. Soy might not be the word, or food, on everybody's lips, but if Marie Oser, author of Soy of Cooking, had her way, it certainly would be. A chapter called The Soyfoods Pantry lists essential items to have on hand as part of your new food repertoire, with descriptions and uses. Prominent foods in the cookbook include tempeh, soymilk, and miso, [also]..interesting products such as Canadian Veggie Bacon; Gimme Lean, a sausage and ground beef flavored product; textured vegetable Protein, TVP, used as a meat substitute; and Lean Links Italian, which taste just like Italian sausage. Oser [has] experimented with these ingredients, creating recipes that are not only tasty, but healthful." "In our quest for the "perfect" food, soy has emerged as an incredibly healthy choice. According to a report in the New England Journal of Medicine, eating soy in place of animal protein has been found to significantly lower cholesterol, the risk of heart disease and cancer and helps prevent osteoporosis. But does it taste good? Well, incorporated into the delicious recipes in Marie Oser's Soy of Cooking, it certainly does! Gourmet cook Marie Oser is so enamored of the benefits of soy that she had to write a book about it. "Soy of Cooking promotes cooking healthy with soy. [Using] over 30 soyfood ingredients, 172 recipes can be made...which are highly flavored and packed with protein. Oser stressed that substituting with soy...is especially beneficial because soy has the ability to lower cholesterol. In fact, the higher the concentration of cholesterol, the greater the ability of soy to reduce it. Marie in Philadelphia shooting two segments for the locally produced national television program Home Matters, shown on the Discovery Channel. 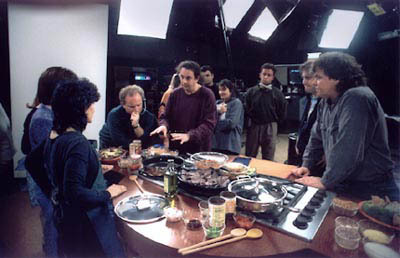 soy segment with author Marie Oser (apron). Host Susan Powell is apparently amazed at the versatility of soy.